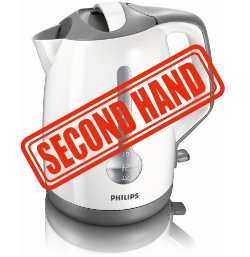 A survey carried out by Halifax Home Insurance showed that one-in-four second-hand electrical goods failed a standard safety check. The company's senior underwriter, Vicky Emmott, commented: "We are calling on anyone buying or selling second-hand electrical items to ensure that the goods meet the required safety standards. Failure to do so could not only leave the sellers open to prosecution but cause damage to the users' home and put lives as risk." If you supply or sell second-hand electrical equipment as a business, this includes charity shops and auctions, it must be safe and meet the requirements of The Electrical Equipment (Safety) Regulations 1994. There is no specific requirement for safety testing in the regulations, however to ensure the equipment is safe some form of inspection and testing will usually be required. All plugs, sockets (e.g. on extension cables), and adaptors must also meet the Plug & Sockets etc. (Safety) Regulations 1994. Older plugs (pre 1984), without the sleeving on the live and neutral pins must be replaced. Plugs and fuses must have have an approval mark: ASTA Diamond Mark, BSI Kitemark, or Nemko N Mark. Re-wirable plugs must also be supplied with wiring instructions, usually on a card over the pins or on a tape around the flex. Second-hand equipment is not required to meet the CE marking requirements and does not need a Declaration of Conformity (DoF). The term ‘supply’ means that it is not just sellers of electrical equipment that need to comply with these regulations. Landlords providing electrical equipment in rented accommodation and businesses that loan, lease, rent, or give away electrical equipment also have the same responsibilities.